The title, Fault Lines, refers to the rock deformations created by the movement of the tectonic plates that causes compression and tension that ruptures the earth’s surface. This is a rich metaphor to describe the differential speed of data flow as it is transferred from one level of the circuit to another. Fault Lines experiments with the possibility of connection and the disjunctions or “fault lines” we live in as a result of telematics. For example, the rate at which information can be generated by the seismograph and recorded by computer is much faster than the labours of weaving: approximately fifteen minutes of seismic activity translates into two to three hours of weaving which then translates into three feet of cloth. This encoding of space and time into tangible material substances highlights the disjunctions in time and the transformation of labour value by technological systems in the contemporary era: the cloth stands in contrast to the reams of paper hanging on the gallery wall. The conections and their various nodes were visually integrated into the exhibition sites. Schematic diagrams of the information movement, drawn by the artist in charge of that space, spatialized the abstract data flow to the public, referencing the display forms particular to popular science museums. In Montreal, a calendar on the wall contained polaroid snapshots of the workers who wove that day. The calendar is another social technology that allows us to image time and supplements the record woven into the cloth. These mappings are commensurate with one of the project’s objectives: an exploration and elaboration of the temporal and spatial shifts, the ruptures being produced as new technologies burst into the cultural sphere. In addition to their explanatory function, these spatial and temporal mappings also provided a visual context for the machinery situated in the gallery. My one criticism of the show is this: I found the absence of a schedule for weaving disappointing. Posting a schedule would have been of assistance to curious onlookers who wanted to see the apparatus at work. While practice and process are key, and the cloth is not the end product of the exhibit, it is still an important component. Beautifully constituted in black-and-white cotton, it is marked by a jagged white line down the middle indicating the seismic activities. This record is interstected by a thin line of yellow (in California) or red (in Montreal) to mark the day. If you look closely at the material, there are varying degrees of tightness of weave depending on the weaver’s touch. In contrast to the paper, the tissue contains the traces of the human hands at work. Fault Lines highlights the work involved in the production of this fabric of both cloth and social relations, materializing these abstract flows. The complex web of technological linkings, institutional organization, personal contacts for a circumscribed period of time is what characterizes this work: this is what is woven into the exhibition. In its overt concern with the documentation of contemporary ways of understanding space and time, the exhibition taps into the history of narrative and accounting that are part of the textile tradition. In Europe, for example, tapestries were used in the Middle Ages to record battles. 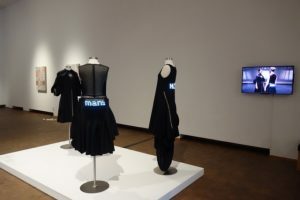 The exhibition poses the question of why a piece of cloth produced in the context of art appears to have less truth value than the same markings on a piece of bond paper spewed out by a computer in a laboratory setting. In this instance, the truth value of the data encoded in the piece of cloth is no less accurate than the information documented by the seismograph. Evidently, the context and the medium affect the way we perceive the truth value of the record. We are confronted with a fault line between our received notions of the appropriate medium for conveying scientific data and the idea that scientific information is objective, or independent of the way it is communicated. As Fault Lines suggests, all representations are mediated. There is no pure information: we are always within the realm of communication. The history of textiles, communications, and computer technologies are integral and Fault Lines recollects this link. Weaving has always been at the vanguard of machine development. The organization of whole cloth out of separate threads in intricate patterns involves the systematic organization of data. The Chinese draw loom, which dates back as far as 1,000 B.C., required that about 15,000 different warp threads be lifted in various combinations to produce designs in the silks. The Jacquard loom, created in the 1800s, was the precursor to computer software. Indeed, Charles Babbage and Ada Lovelace modeled their Analytical Engine on the principles which Jacquard devised for regulating complicated patterns by punched cards for the fabrication of materials such as brocade. Because of the link between women and weaving, from the legend of Penelope to the musings of Freud, in some renditions of feminist cybertheory the complex ordering of warp and weft provides one of the dominant metaphors for understanding the telematic environment. The connection between weaving and cyberspace is taken as evidence that the Matrix is a feminine realm. While both artists are concerned about gender, these questions are discreet. The exhibition playfully intervenes in the very gendered practices of computer science. Transformations in our means of communications create new possibilities for exhibition practices and forms of “display” other than those found in contemporary galleries. Telemedia projects, such as Fault Lines, utilize the telecommunications systems as the primary medium of artistic production. The Internet, as used by Layne and Bachman, is at once research tool for the project as well as the mode of transmission of information. Fault Lines is an excellent example of many of the features of what is an emerging tread in the arts: the use of the Internet in its realization. No longer confined to its walls, the galleries potentially become a laboratory to test ideas and one of the nodes information passes through.